I’m so glad you posted this recipe. When I saw the pictures I thought this was something even I could make! You could make this since it requires no cooking. I plan to think of you while posting in the future. I’d love to see you expand more on your cooking skills. I know you have it in you. These strawberries look beautiful and I would be taste as good. I look forward to trying them out. How do you make them stand? Are they in a special container that has small holes to keep them standing upright? You cut a tiny tip off the strawberries. It’s just enough to get them to stand. These look fun and yummy! I pinned this recipe. Thank you for sharing. I’m thinking thqt these would be beautiful on topof a cheesecake. What do you think would be a good substitute for the powdered sugar? Splenda could be a good substitute. I believe there is a conversion on the Splenda box to tell you how much to use. Do you think that the marshmallow/philly cream cheese dip is a good alternative to the marscapone? I was trying to find an alternaltive center. Filling the strawberries with a sweetened creamy filling is always yummy! So that should work. answered my question.. you strawberries look so sweet. Could you tell me about the yogurt?banana mixture you made- Im not sure if I even know what mascarpone cheese is? Looks good for the fourth. 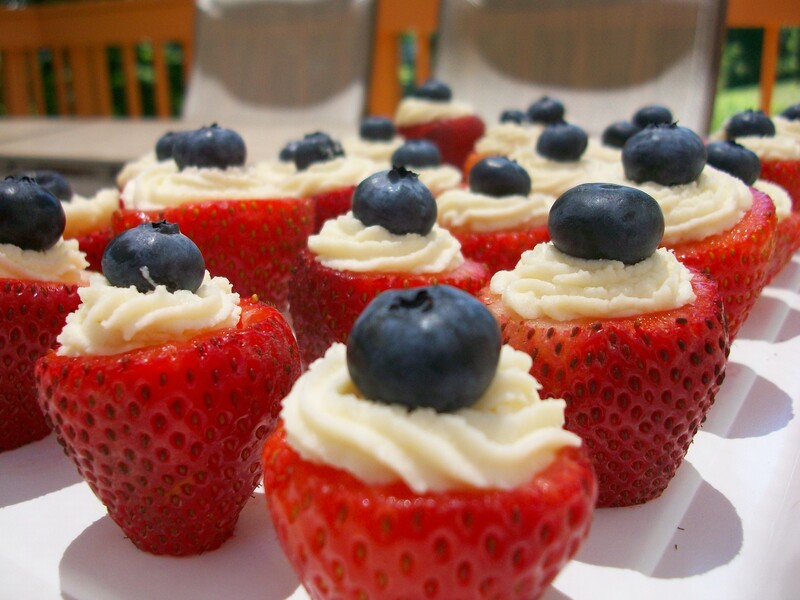 I have made these with Philly cream cheeses mixture for their no bake cheese cake. Very yummy!